Here it is, guys – the last PPV of the year! 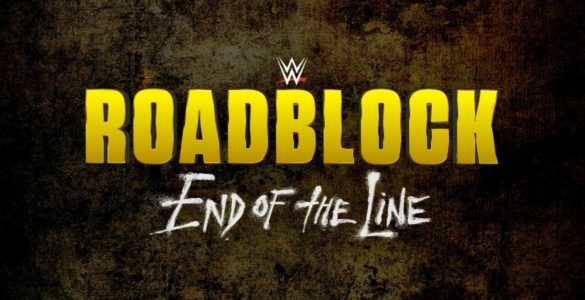 Roadblock End of the Line will close 2016 for the WWE. Are we going to get new champions for the New Year? Here are my predictions! The 10-minutes time limit was put there for a reason. It will elapse without a definite winner and it will make both guys look good at the end of Roadblock. Braun Strowman was bragging that he could take out Sami in less than 2 minutes. Sami will last 5 times more and he’ll look like a badass for it. Strowman will dominate and will continue being a menacing giant. Really, the 10-minutes limit was an incredibly simple but perfect stipulation. Big Cass will most probably take this one home. Enzo will somehow get involved, annoy Lana at ringside, Rusev will get distracted and eventually, pinned. This is a really boring and predictable outcome but it is the most likely one. In a fantasy booking scenario, I’d have Rusev dominate Cass and Enzo and then walk out victorious. Then again, from my perspective Rusev is the face here. The WWE sees things quite differently and so expect Rusev to be humiliated for no reason at Roadblock. If you had asked me a week ago, I would have told you that Swann was bound to win. This title can’t continue to be tossed around like a hot potato forever. Then again, the storyline seems to be leading somewhere else. My prediction is that TJP will turn heel at Roadblock. He’ll stab Swann in the back and win. This will show that Brian Kendrick was right about him all along and it will show that the student listened to the mentor after all. Please, let it be Sasha! The Boss cannot afford to win the title on RAW and lose it at the following PPV yet again. Roadblock needs to be Sasha’s night. If Charlotte gets the win on Sunday, the fans might just quit on the RAW Women’s division. The booking has been a complete joke there. What I dread about this match is Ric Flair’s involvement. With the way the feud was built up, the Nature Boy is likely to show up at RoadBlock and cost Charlotte the match. The Iron Woman match is grand enough on its own, it doesn’t need Ric Flair but the WWE seems to think otherwise. I actually want Jericho to win but the only way Seth is going down on Sunday with all that momentum he has is if Triple H shows up and screws him over. However, I think the Game will play mind games. If he shows up at Roadblock, it will be to screw Reigns, not Rollins, showing Seth that he’s not important to him. So, unfortunately, I expect Jericho to lose. I’d rather have Chris gain momentum here and then enter the KO feud on a high note. If he could become a champion one more time, I would applaud. Yeah, Reigns looked great, holding both titles on RAW but he’s not getting that ending at Roadblock. Owens as champion is still important to Triple H and Triple H is important to what Rollins is doing. This match won’t be about Roman. It will be about Triple H vs. Rollins. There is no way this match is ending clean. There will be so much chaos and confusion in the end that you’ll forget what the match was about but the champ will retain. My question here is when Roman Reigns will finally defend the US title. This championship should have stayed with Rusev. It was much more useful around his waist. Who do you think will come victorious at Roadblock? Leave a comment and let us know!